If you are getting in to St. Louis on Friday and you need housing, remember to contact Nick at LOCKINHOUSING@gmail.com. Also, if you are getting into St. Louis on Friday, and you are looking for something fun to do, we will be playing polo at our Maplewood rink from 6pm-10pm. 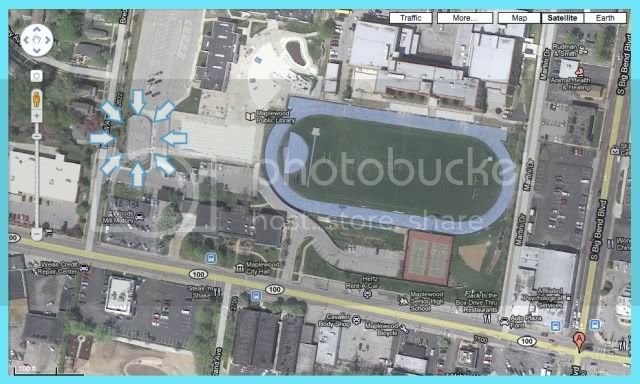 The Maplewood rink can be found at 7601 Manchester Road - Saint Louis, MO 63143-2840 behind the police station. This probably isn't happening...Thanks to the recent snow storm, and despite our best efforts, all of our outdoor rinks are snowy, icy messes. Just go to Handlebar and enjoy cheap drinks. After polo, we will be heading to HandleBar for cheap drinks until 3am in celebration of Jake's birthday. HandleBar can be found at 4127 Manchester Road - Saint Louis, MO 63110. Order yourself a dose of Wheeler's Tall Bike - A double decker shot special available until midnight. After staying out too late and drinking too much on Friday night, we will all meet at The Skatuim on Saturday to experience a true, dead-of-winter Bike Polo Lock-In. Check in for the 2011 STL Bike Polo Lock-In starts at Noon on the 15th. The Skatium's address is 120 Catalan Street - Saint Louis, MO 63111. Hey all you lock in partiers! Looks like snow this week in StL. And some Saturday. Be prepared for sledding trips! Snowball fights! And shoveling off a court on Sunday! Listen to what Jake says. STL Bike Polo loves Polo, Partying, and Snow. Bring snow clothes! They won't go unused.